15 Commercial Real Estate & Properties in Nanango are listed in 5 categories. We have 7 Industrial Warehouses Sale & Lease , 4 Retail ShopsSale & Lease , 2 Other Commercial PropertiesSale & Lease , 1 Commercial FarmsSale & Lease and 1 Development LandsSale & Lease . Offering main street frontage in a vibrant community with air conditioning, kitchen facilities at the rear of the shop. Previously used as a hair dressing salon, but could be easily converted to a coffee lounge. The options are only limited to your imagination. Why not secure your future and start your own business. Contact the team at Freeman Estates today for an inspection 07 4163 2588. If you are looking for Self Storage, Mini Storage, or Security storage than this complex offers all of the above. Our storage sheds consist of sizing from 3m x 3m, 6m x 6m and 5m x 3.6m all at reasonable rates. The complex is under 24 hour surveillance and also offers Pin Access security to the front automated gate for peace of mind. The yard is fully fenced and offers easy access to each unit or for any large vehicles. An easy to find location, please call Freeman Estates Nanango on 07 41362588 to secure your shed today or for any further information. Are you looking for Mini Storage, Self Storage or a Large Industrial Shed? Grevillea Industrial Park cater sheds of all size, our storage sheds include 6m x 3m, 3m x 3m and 2m x 1m sizing. If you are looking for a larger shed to run a business from, store excessive stock or even store vehicles we have various sized commercial sheds and security fenced yards. The complex is fully fenced and located in an easy location for truck access. Organise your shed today by contacting Freeman Estates Nanango on 07 41632588. If you are looking for Self Storage, Mini Storage, or Security storage than this complex offers all of the above. Our storage sheds consist of sizing from 3m x 3m, 6m x 6m and 5m x 3.6m all at reasonable rates. The complex is under 24 hour surveillance and also offers Pin Access security to the front automated gate for peace of mind. The yard is fully fenced and offers easy access to each unit or for any large vehicles. An easy to find location, please call Ray White Nanango on 07 41362588 to secure your shed today or for any further information. 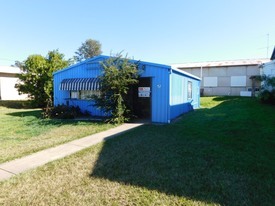 Are you looking for Mini Storage, Self Storage or a Large Industrial Shed? Grevillea Industrial Park cater sheds of all size, our storage sheds include 6m x 3m, 3m x 3m and 2m x 1m sizing. If you are looking for a larger shed to run a business from, store excessive stock or even store vehicles we have various sized commercial sheds and security fenced yards. The complex is fully fenced and located in an easy location for truck access. Organise your Shed today by contacting Ray White Nanango on 07 41632588.